Pick your favorite fruit, add some sugar and place on top of your favorite rolled out flaky pie dough. A galette is basically a free form version of a pie or tart. They can be sweet or savory. No pan is needed, just some basic skill at folding the crust over the fruit or savory ingredients, to resemble an open face pie. It presents a rustic feel with an simple elegant touch. I know you want to try this 🙂 Just maybe feeling intimidated by making a pie crust, then just go buy one. It’s not the end of the world, but I will highly recommend that you try making a homemade crust at some point. Slightly sweetened fresh fruit packaged around flaky pastry is blissful! Put oven rack in middle position and preheat oven to 425°F. Line a large baking sheet with parchment paper. 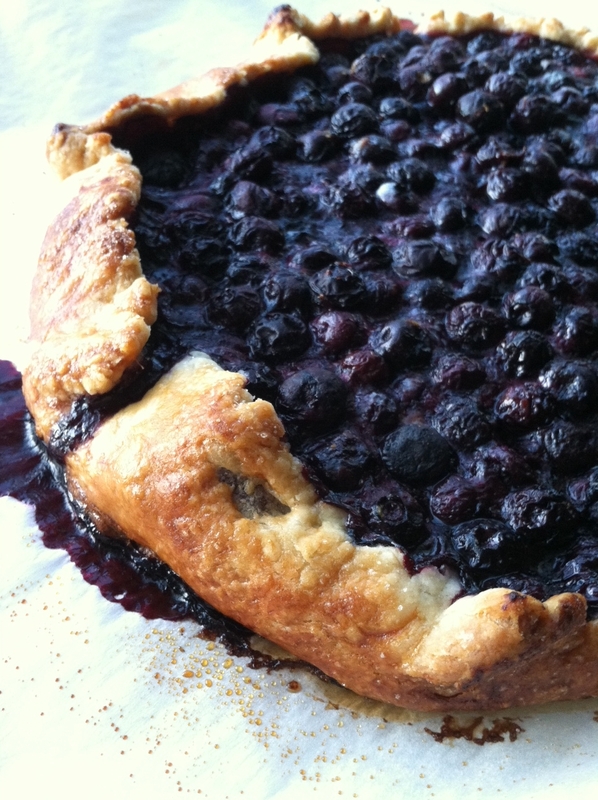 Unwrap store-bought pie dough and unfold onto baking sheet, then spoon blueberry mixture onto center of dough, leaving a 1 1/2-inch border around edge. Or follow the crust recipe below. There are two methods to pick from. 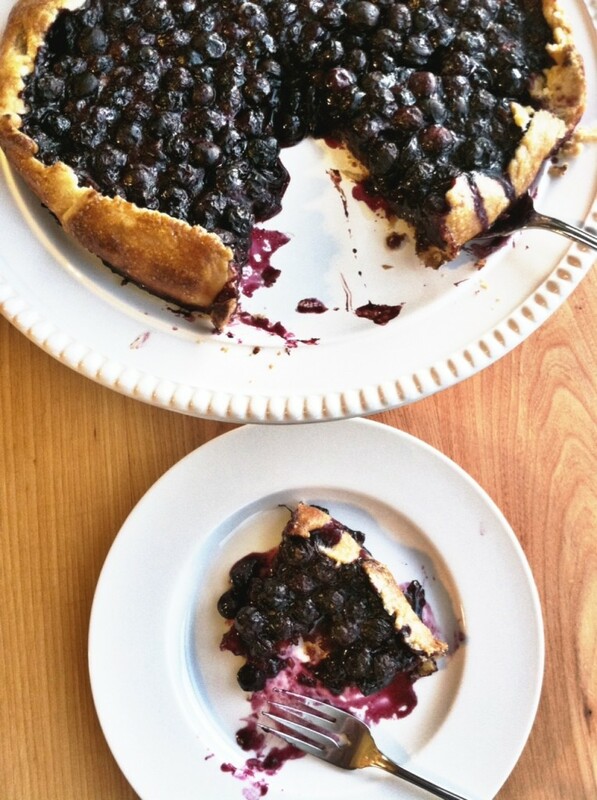 Bake until blueberry filling is bubbling and pastry is golden, 25 to 30 minutes. Cool slightly on baking sheet on a rack. Serve warm or at room temperature. Tip: Any leftover pastry can be frozen. I’d recommend to use within a month. Let the pastry defrost in the refrigerator over night. Tip: I have used Crisco (shortening) from the can as well. It isn’t chilled but it seems to work just fine. Tip: There have been times when I don’t refrigerate the pastry. It just depends on the time I have or don’t have. Yes, chilled dough is the best to work with but I still get great results when I don’t refrigerate. The trick is cold butter and cold water; then work fast so the pastry doesn’t stick. Mix flour, sugar and salt in a bowl. Cut in shortening, using a pastry blender or crisscrossing 2 knives, until particles are size of small peas. Sprinkle with cold water, 1 T. at a time, tossing with fork until all flour is moistened and pastry almost leaves side of bowl (1 to 2 tsp. more water can be added if necessary). Gather pastry into a ball. Shape into a flattened round on lightly floured surface. 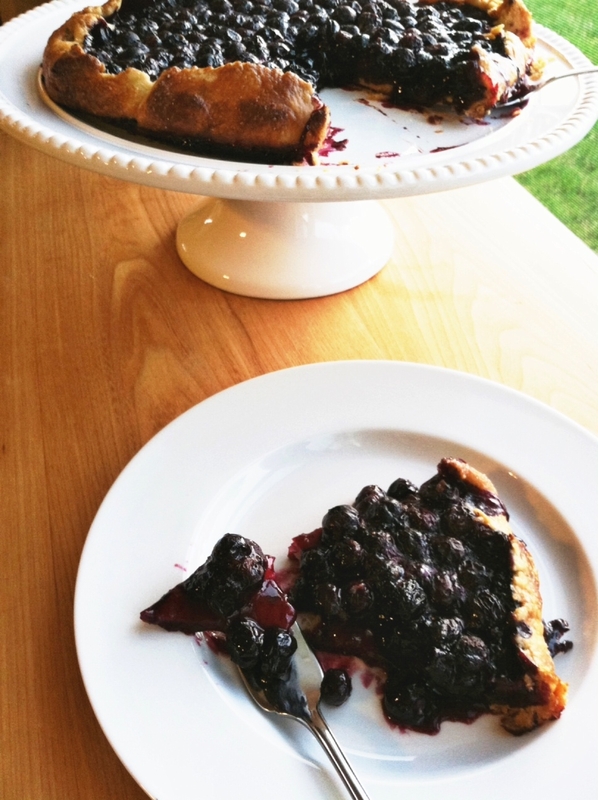 (For Two-Crust Pie, divide pastry in half and shape into 2 rounds.) If desired, wrap flattened round of pastry in plastic wrap and refrigerate about 30 minutes to firm up the shortening slightly, which helps make the baked pastry more flaky and lets the water absorb evenly throughout the dough. If refrigerated longer, let pastry soften slightly before rolling. Roll pastry on lightly floured surface, sprinkle top of pastry with a little flour and then roll, into circle 2-inches larger than upside-down pie plate, 9 x 1 1/4-inches. Fold pastry in half and move it to the parchment lined baking sheet. Unfold into a round. Follow the method above when adding the filling and baking the galette.